Volleyball transition is one important skill that often gives troubles for the players. It is challenging to transition i.e. from a blocker to an offensive player after the team defense has managed to dig the ball up. Read tips for a better transition, or how to practice it? Why Volleyball Transition Feels Difficult? The players have a very limited time to move from a blocker's position to a hitter – or from the blocker’s position to play defense and after the defense to swing the ball. As in many other drills, it is needed to practice transitioning with the ball and in the game situation. However, it is very beneficial for the player to practice footwork and coordination of transition also without the ball. This is one of the few drills that really pays off when practicing it by your own or without the ball. Volleyball transitioning drills without the ball can also serve as an excellent volleyball conditioning drill. How to Do the Volleyball Transition? It is a good idea for player to use same routine every time when backing off the block. It helps to learn the transition smoothly when repeating the same routine one after another. Also test how to move from a blocker to a defensive position - and after the defense to start a spike approach. To practice those two transitions you just repeat the routines. However, you still have to remember that in the match you may have to block inside or outside. For example if you are blocking inside, you have a longer distance back to the hitting position. It is also the fact that when performing a swing block, sometimes the blockers are “flying” and stopping somewhere outside the court. So in the match you also need to be ready to adjust your transition steps because you don’t always know the exact position you are landing to. Players need to be exposed to those different situations in game-like practice drills, so they learn to adjust the steps without any problems. Repeating the standard transition helps you to learn the technique when it is introduced. However, the players need to be exposed to transitions in the game-like drills because the transition could be slightly different in the match. After landing a player turns around (facing the court) and takes a big step with the right foot. It depends on the length of the step, but the foot could be placed somewhere around 4-6 feet off the net. The player takes another step and places left foot on the ground. The foot could be around 7-9 feet off the net. On the third step, the player turns around to face the net again. The right foot lands around 11-12 feet off the net – being ready to start a hitting approach (right-left-right-left). The right side players perform this as a mirrow image. 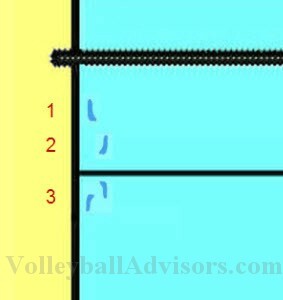 Middles transitions are also very similar - on the left side as the left side spiker and on the right side as the right side spiker. 1) If you are in a real hurry, you may have time only to back pedal a couple of quick steps, then perform a “half approach”. 2) If you have time for the full approach, like above, it is a better option. Here in the video, you see a pretty good example about the good transition. In the first transition, the player turns around a full turn and takes few fast transition steps. Second and third transitions are not perfect examples anymore – but at least you see how it should be done – and how it shouldn’t. Look at the long rally and the first transition in this YouTube video. It is a pretty good example of good transition. 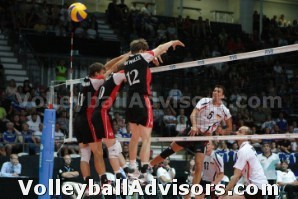 It occurs between 0.06 and 0.11 in this video when an outside hitter on a red team transitions. The player you need to look at is on the left court side. At 0.06 the outside hitter on the left court side makes the first swing. She hits the block and the ball is reflected back to her own court side. She is in a hurry to approach again, therefore she turns around, takes a few fast steps and she is way beyond the 10 foot line to approach again at 0.09 when the setter has the set. At 0.11 she makes the second swing. The first transition the player makes is a pretty good example. On the right hand side, everything works as a mirror image. Backpedaling – Good or Bad? The rally continues and the next transitions are not the best possible examples. The player backpedals and backs up slowly compared to the first transition. In some situations “backpedaling” could be a reasonable choice. I.e. sometimes for the middle, it could be a reasonable option to “backpedal” and take one or two short quick steps back - when the player simply do not have enough time to make a complete transition. However, generally speaking the player should always turn around by opening up your body towards the court, just like the outside hitter in the video makes in the first transition. Or in the following video starting at 0.12 the middle blocker performs two transitions in a row by back pedaling. Pay attention to middle blockers transition at 0.12. He performs two transitions by backpadaling in a row. You also see an excellent example of the middle blocker who transitions by packpedaling on the first video between the 0.02 and 0.11.